As you can see from past reviews, I am Mr. Ms. Marvel here at CTG. I'm already vaguely aware that Kamala is gonna be front and centre for a Marvel Multimedia Thing this year in the form of Marvel Rising, a webtoon / animated movie / comic series / synergy juggernaut. This teaser comic is available today for the low, low price of zero dollars. Is it worth the time it takes to find it, download it, and read it? My answer is an emphatic "yes!" Kamala needs extra credit to make up for classes missed while superheroing. That means it's time for a STEM field trip under the energetic supervision of Doreen Green, comp sci college student extraordinaire. Obviously, the field trip gets interrupted by an AIM raid that draws out Ms. Marvel and Squirrel Girl, and they team up splendidly (With Tippy-Toe!) to clobber Beekeeper-mooks and protect Kamala's fellow students. Kamala is also equipped with a new classmate in the form of the ultra-moody Ember. Besides having a flashing neon sign over her that says "designated event protagonist" (not literally but c'mon there's a full-page AIM report on her after the comic), she gets in a few lines here that serve to anchor the Eeyore end of the optimism vs. pessimism scale. That allows Kamala to seek a happy middle on that spectrum - just a touch below Squirrel Girl's manic positivity, but not uncharacteristically gloomy. It also plows some fertile ground for attitude conflicts between the three characters in the future. It's a remarkably fun romp, and Devin Grayson demonstrates reassuring insight into both protagonists. Marco Failla's art also contributes to the premium feel; we get polished visuals to go along with the clever dialogue and well-paced plot. At their finest moments, the visuals give off a great Nextwave-era Stuart Immonen vibe. Ms. Grayson does exercise a penchant for groan-worthy dad-joke puns, though. We would expect nothing less from Squirrel Girl and Ms. Marvel after winning a straightforward "all in a day's work" fight against AIM. I really respect the thought and care invested in plot, character, and villain development here. A "yay STEM" story is perfect for Kamala and especially Doreen, AIM is an ideal antagonist for Science Heroics, and it looks like Ember's Inhuman powers are going to be tailored to suit a computer science / video gaming theme for the main event. 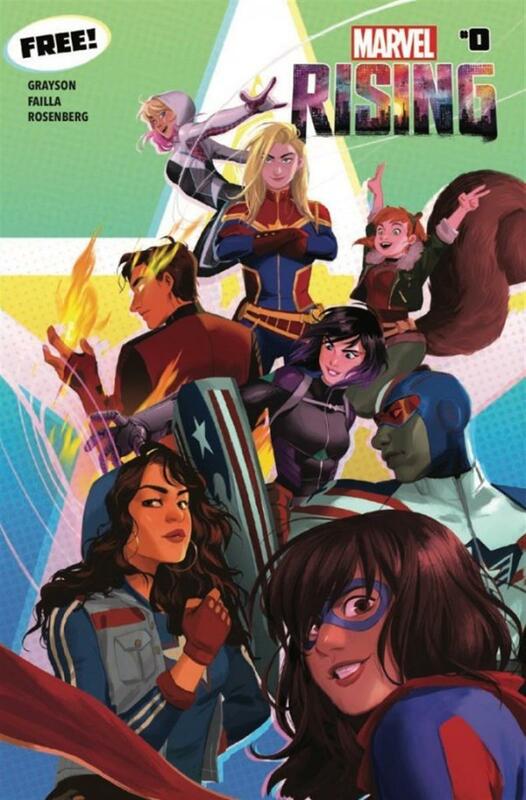 In the future, Marvel Rising will deliver a two-issue Ms. Marvel / Squirrel Girl story written by the Best Possible Writers, G. Willow Wilson and Ryan North. The visuals will handled by Irene Strychalski, the capable, cartoony artist who backstopped GuriHiru on Gwenpool. (GuriHiru will be doing covers for the whole series.) Wrapped around this double-patty story-burger are a pair of buns in the form of Alpha and Omega issues by the same team as this #0, Devin Grayson and Marco Failla. The biggest accomplishment of Marvel Rising #0 is demonstrating the quality of those buns. (Yikes, that metaphor's getting away from me.) Ms. Grayson and Mr. Failla are serving notice that they're not treating this as a low-effort cash-in; they deliver top-shelf content crafted with care for an all-ages audience. This freebie is well worth a look in itself, and it also does a superb job of firing us up for subsequent issues. Raising Marvel-loving tweens? Good news: You'll enjoy Marvel Rising as much as they will!